This post will explain in detail how to go about setting up Travis CI deployment in a nodejs project. Continuous Integration is the continuous practice of merging in small code changes frequently - rather than merging in a large change at the end of a development cycle. The goal is to build healthier software by developing and testing in smaller increments. This is where Travis CI comes in. 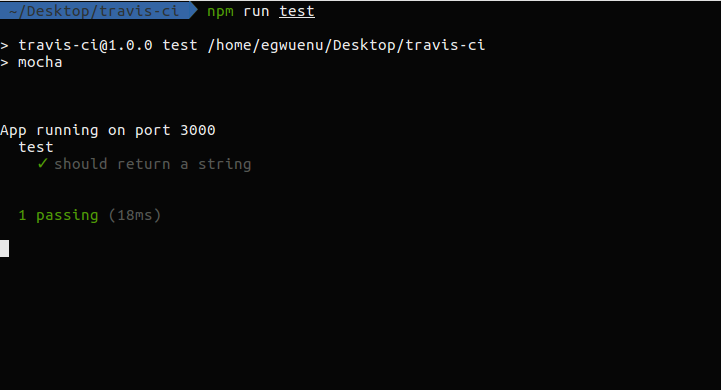 In order to test the way Travis CI works we need to setup a Node project with tests. Make sure you have node and npm installed node -v and npm -v to check the versions. create an index.js file in root directory with the following. Also create a test folder and an index-spec.js file for testing our node app. Make sure app and test is working by running these scripts. create a file .travis.yml in your root directory. The .travis.yml file indicated above is what instructs Travis on what to build. the language option can be whatever language your app is running in and the "node_js": "stable" indicates Travis should use a stable version of node. You can also cache your node_modules directory on Travis to avoid installing all dependencies every time a build is triggered but rather it updates packages that has newer versions. more options that be added to this file can be found here. * Travis build is triggered and it checks if the test is passing or failing. * Create a github repo and push the project folder to GitHub. * Make a change and push a commit to the repo. You should automatically see your build process running. * Add the travis badge to a README.md file in your GitHub repo. Conclusion Travis CI makes developing software efficient. it ensures you deploy clean code that follows good practice and also detects if there are possible bugs or deficit in your code caused by a change or refactor in your project. All code is available on the Github repo. Also feel free to leave a comment with questions or thoughts.